A classically trained musician gone rogue, Lindsey Stirling is the epitome of independent, millennial-defined success: After being voted off the set of America's Got Talent, she went on to amass more than 10 million social media fans, record two full-length albums, release multiple hits with billions of YouTube views, and tour sold-out venues across the world. Lindsey is not afraid to be herself. In fact it's her confidence and individuality that have propelled her into the spotlight. But the road hasn't been easy. After being rejected by talent scouts, by music reps, and eventually on national television, Lindsey forged her own path step by step. Detailing every trial and triumph she has faced until now, Lindsey shares stories of her humble yet charmed childhood, humorous adolescence, life as a struggling musician, personal struggles with anorexia, and finally success as a world-class entertainer. Lindsey's magnetizing story - at once remarkable and universal - is a testimony that there is no singular recipe for success, and despite what people may say, sometimes it's okay to be The Only Pirate at the Party. Most fans of Lindsey's art are also fans of Lindsey the person too, and for good reason. She's always been incredibly open and accessible to her followers. Within her interviews or behind-the-scenes videos, she'll do or say something that will resonate with pretty much everyone. Her gracious and respectful attitude towards her fans is endearing, humble and refreshing. It makes us all feel like we're her friends, and that connectivity is also there in her and Brooke's book. Listening to The Only Pirate at the Party made me feel like I spent the day with a kindred spirit. Lindsey bravely opens her hearts to all of us with a sincerity that makes her funny stories come alive, her embarrassing moments induce sympathetic cringing, and her honest confessions prompt introspective examining of one's own heart. While listening in my car, I had to pull off to the side of the road when Lindsey's voice almost broke while talking about her friend Gavi - she wasn't just reading her own words into a mic for her audio book, she was sharing a personal part of her heart. It was such a raw moment that it moved me to tears. Through her various experiences, adventures and hard-learned lessons, Lindsey radiates joy. By joy I don't mean a manic, sugary fake or cheesy happiness. True joy runs deep, and can be in your heart even if you're in pain. It's something that can be demonstrated by knowing who you are, flaws and all, and loving yourself in spite of it - as well as "tough" loving yourself enough to keep challenging your own self to change and grow. Lindsey and Brooke's words demonstrates this honest joy on every "page" and I found it infectious. As odd as this is going to sound from a perfect stranger on the internet, I am proud of Lindsey for this book, and I'm so happy to have listened to it. I'm inspired, and now I'm going to go do something with that inspiration. This book made me cry, laugh, smile, and much more. It was an incredible emotional roller coaster i enjoyed. 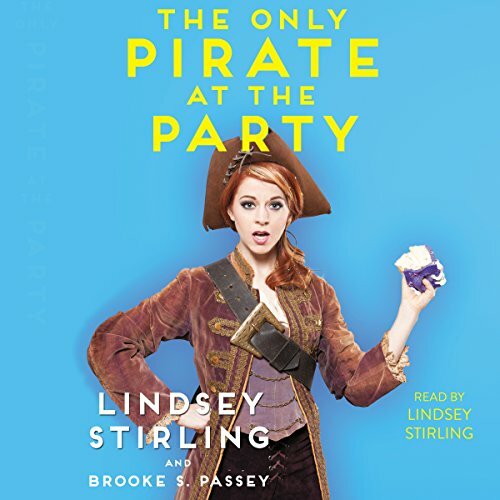 "The only Pirate at the Party" is such a great take on Lindsey Stirling's life, success in the music industry, and much more. Would HIGHLY recommend this to anyone looking for a great, inspirational story that shows anyone can do anything they want, as long as they put their mind to it. Pull Out Your Eyepatch and Take To The High Seas! Story: I've been on a celebrity bio/memoir binge lately and I must say that this particular story stands apart from the rest. It has the typical format you find in other books in the genre explaining the humble beginnings and rise to fame, but it is also so much more. Miss Stirling's stories come across as truly genuine. She is an artist that is sharing her experiences and inviting you into her life, not simply telling a story. You get a good look at her life; her struggles, her determination and work ethic, her pain and joy. Performance: This was definitely one of those performances made better by the fact that the author read her own work. She knows her stories and how to tell them. As a listener, you are sure to feel each and every emotion. I think most people forget that celebrities are real people too and that they go through very similar experiences as the average joe, and that becomes evident at the end of this book when it's true, raw emotion. Overall: Lindsey and Brooke did a fantastic job with this book. I, like most others, found this to be an inspirational listen. I was a fan of Lindsey Stirling's music before this book, and this book has only allowed me to greater appreciate the talent of this artist. I loved this audiobook! I don't normally get audio books but this book changed that when I found out that she (Lindsey Stirling) was doing the narrating I had to get it! I finished it in two days and oh my gosh it was amazing! Beautifully written and read too. You can really feel the emotion when she reads! I would recommend this for anyone who is feeling down in life and needs a good pick me up. Be warned though you will cry and laugh and maybe even smile. Hearing Lindsey herself read her memoir was astounding. She's just so real and down to earth that there really is no reason to not like her. She doesn't use her fame for bad things, heck just listen/read the "My Car" chapter. She's truly inspiring and loves to help people...the book itself was great getting to know Lindsey behind the scenes and such. While reading "The Only Pirate at the Party" I was honestly very happy with the outcome of the book, it was interesting, well detailed and very entertaining. The book put me through constant change of emotions as the story went on and as Lindsey read I could feel her emotion when she talked about the good, the bad, and the okay times of her life. I'm going to be completely honest and say that this book has inspired me and that it was probably the best book I have ever read. If you are a big fan of Lindsay Sterling then this book will be very enjoyable for you. If Anne of greengables was a real person Would be Lyndsay. This colorful artist deliver us a warm and touching story, That as the the red hearded character of Lucy Moud Montgomery, wil turn on a light of hope and happyness in your soul. And the best part is that Lyndsay is a real person whose ups and downs could be yours. So if you are feeling lonely or blue This is certanly the book for you! You wont regreat it! I LOVE Lindsey's music and I really liked her book. It's easy to listen to, fun and light-hearted. You can tell how important her value system is to her, and I think it's awesome that she's managed to become famous without compromising. Was hat Ihnen das Hörerlebnis von The Only Pirate at the Party besonders unterhaltsam gemacht? Ich habe das Buch nich nicht fertig. Ja ich habe auch das Buch. Das Hörbuch habe ich weil es per Gutschein bekommen habe und weil ich ihre Stimme entspannend finde. Aber unabhängig davon, im Buch gibt es bis jetzt keine einzige Seite auf der man nicht mindestens einmal lächlen oder gar sich kaputt lachen muss. Ich lese immer gern ein paar Seiten darin wenn ich mal ne kleine Aufmunterung braucht und das macht dieses Buch auch perfekt für Leute die sich nichtmal für diese Person interessieren. Welcher Moment von The Only Pirate at the Party ist Ihnen besonders im Gedächtnis geblieben? Als sie als Kind Limo verkauft hat mit 30% mehr Zucker da sie diese "30% weniger Zucker" Angaben für Betrug hielt. Welche Figur hat Lindsey Stirling Ihrer Meinung nach am besten interpretiert?